The WÜSTHOF Heavy-Duty Chef’s Knife Giveaway is open to legal United States residents residing in the fifty (50) United States and the District of Columbia and residents of Canada who are eighteen (18) years of age or older. The WÜSTHOF Heavy-Duty Chef’s Knife Giveaway ends on September 17 at 11:59:59 p.m. Eastern Time. 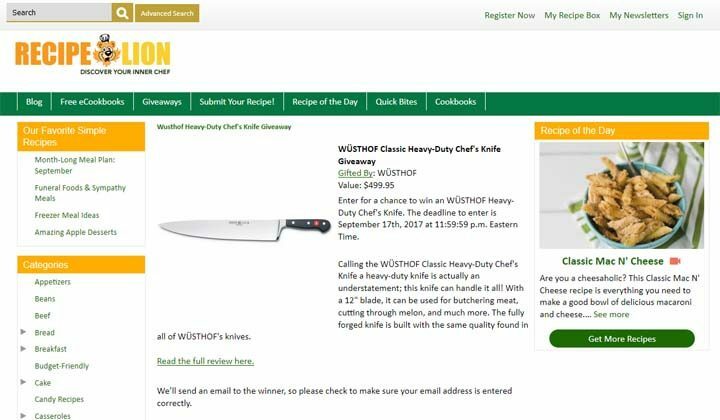 Visit recipelion.com/sweeps/Wusthof-Heavy-Duty-Chef-Knife-Giveaway to complete the entry form. You can enter 5 times a day. One (1) WÜSTHOF’s Heavy-Duty Chef’s Knife with a 12″ blade, it can be used for butchering meat, cutting through melon, and much more. The fully forged knife is built with the same quality found in all of WÜSTHOF’s knives.